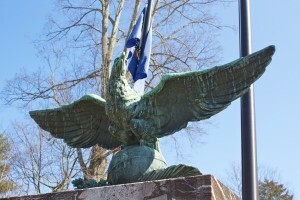 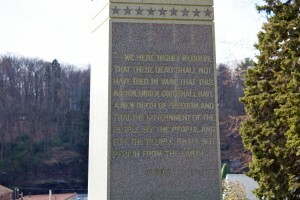 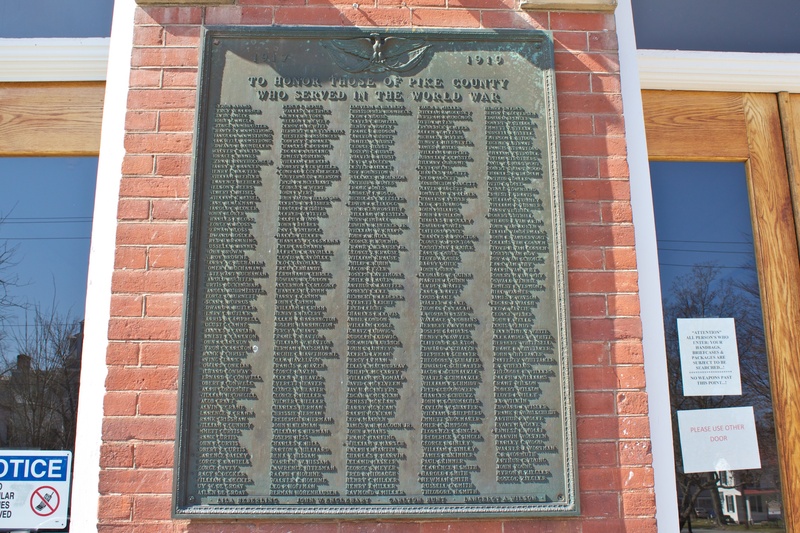 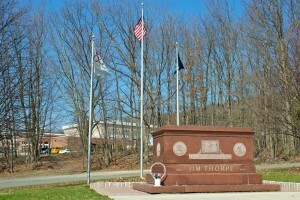 The Borough of Jim Thorpe, PA, honors its Civil War veterans with a zinc monument supplied by a Bridgeport, CT, manufacturer. 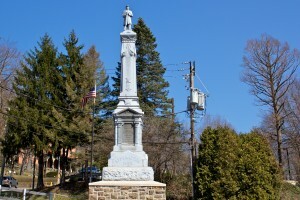 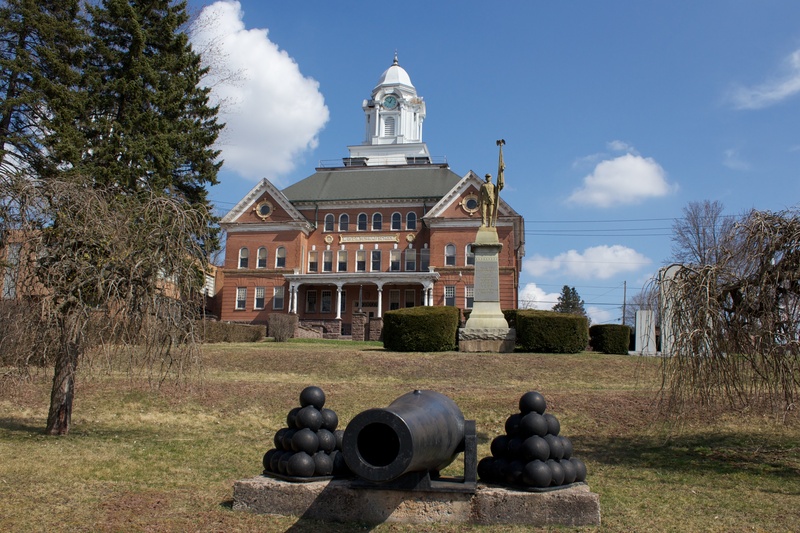 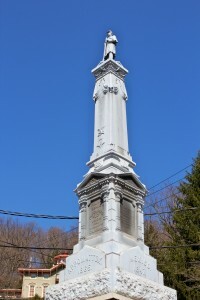 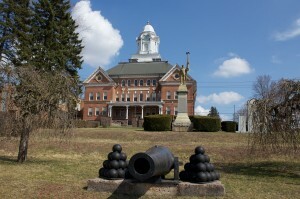 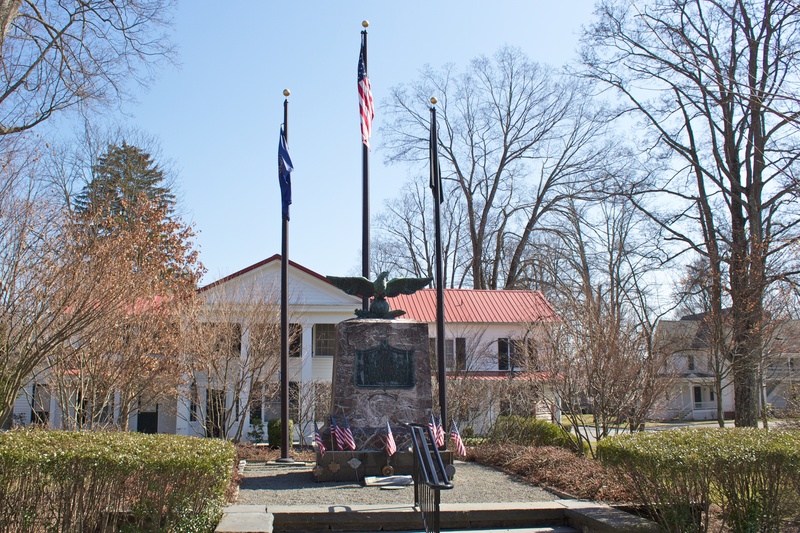 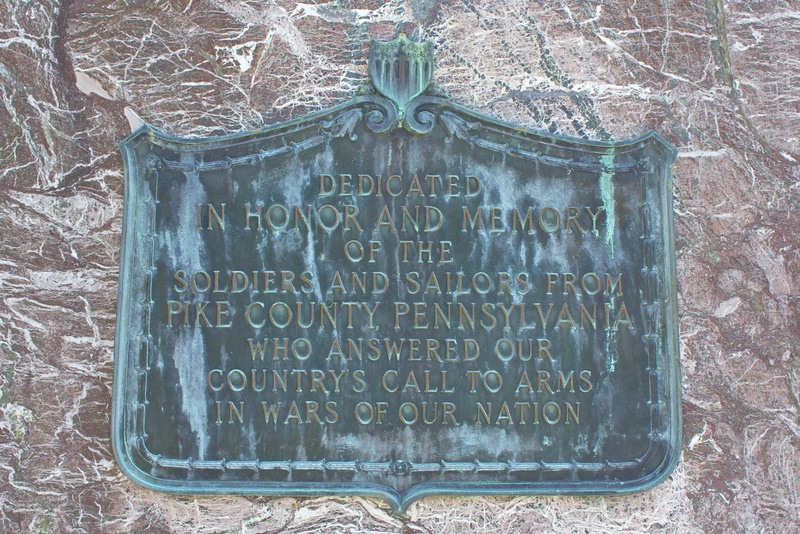 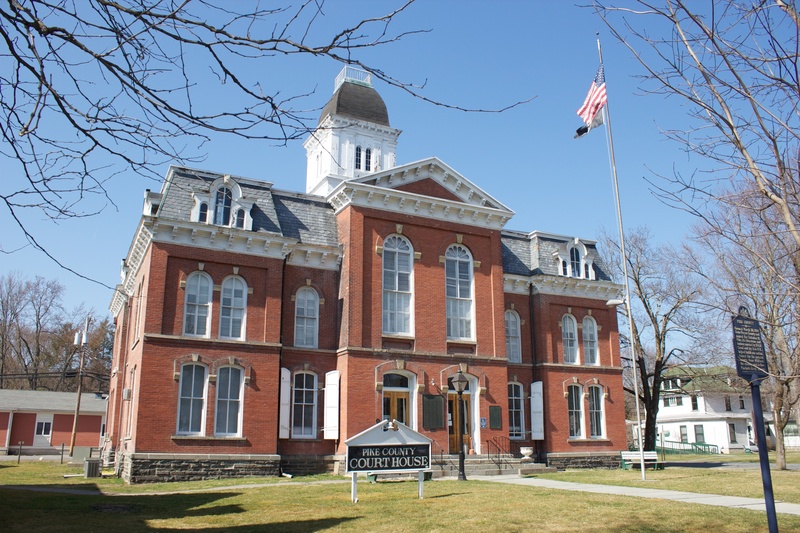 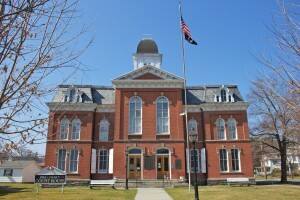 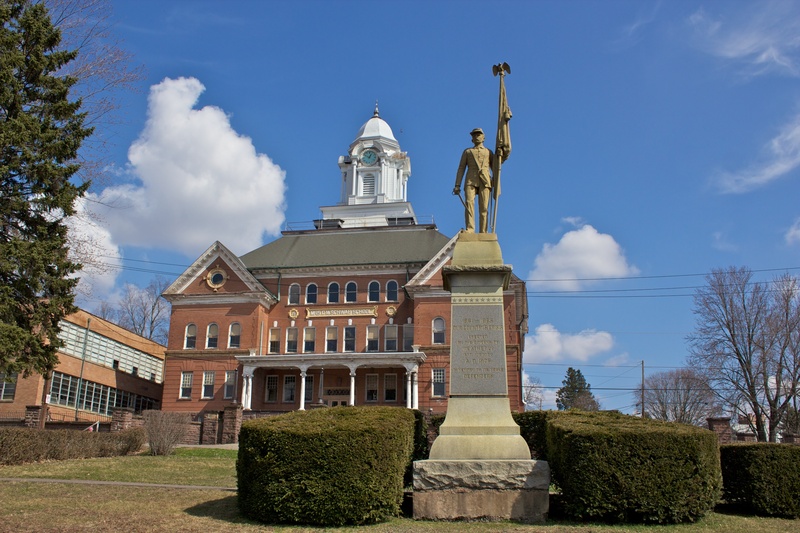 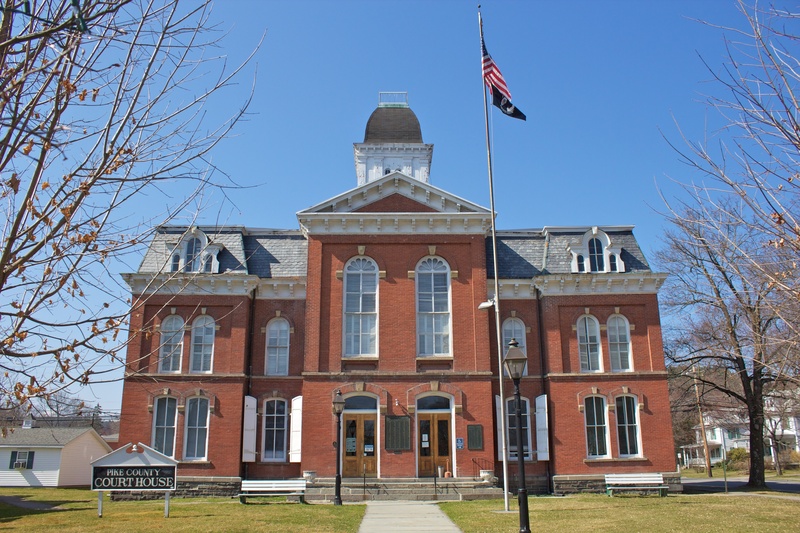 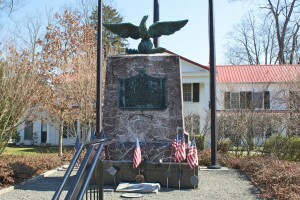 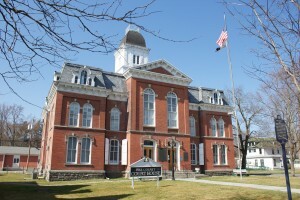 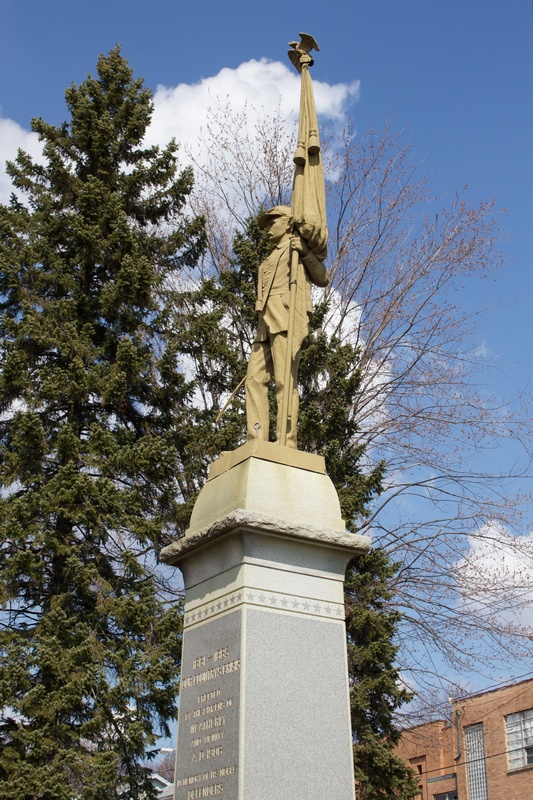 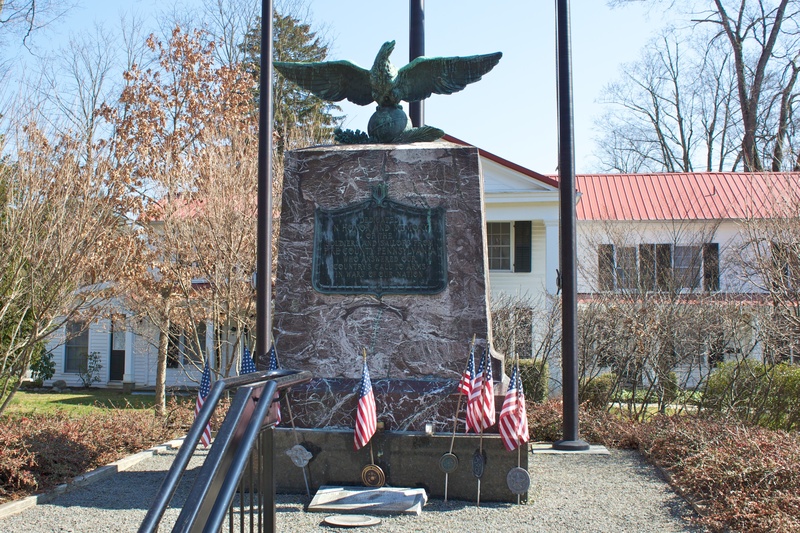 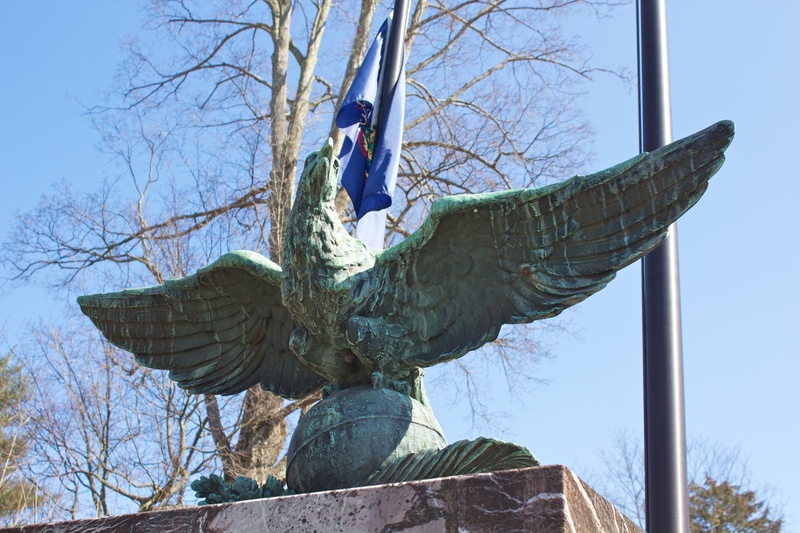 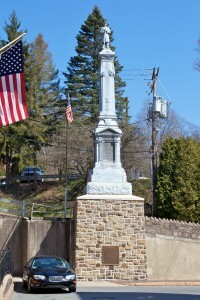 The Soliders and Sailors Monument, which stands near Packer Hill Road and the Carbon County courthouse, was dedicated in 1886 to honor veterans of the Civil War and earlier conflicts from the borough (then named Mauch Chunk) and nearby communities. 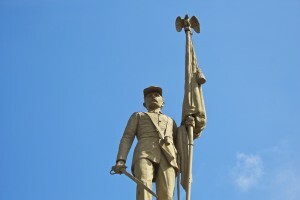 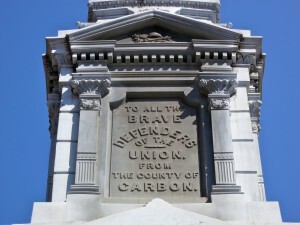 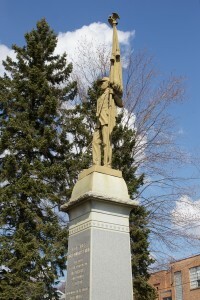 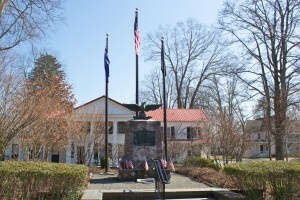 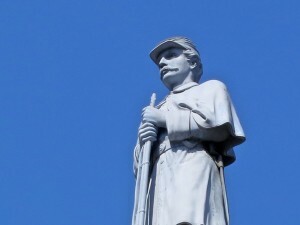 A dedication on the monument’s front (south) face reads, “To the brave defenders of the Union from the County of Carbon.” The battle of Appomattox is also listed on the south face. 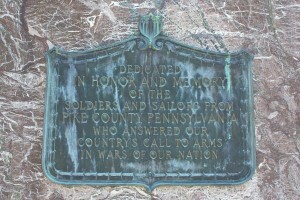 The east face also honors veterans of the 1847 Mexican War. 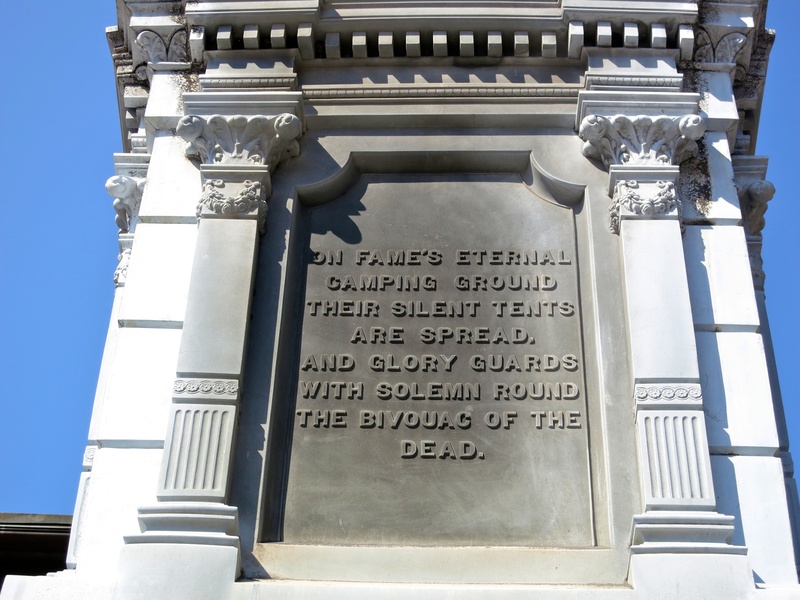 The north face lists the Civil War battles of the Wilderness, Hampton Roads, Antietam and Gettysburg, as well as the 1815 Battle of New Orleans. The monument also has an Honor Roll plaque on the base of its south face honoring the county’s World War II veterans. 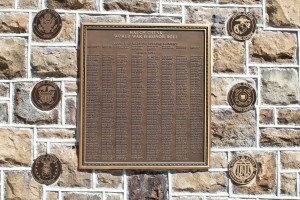 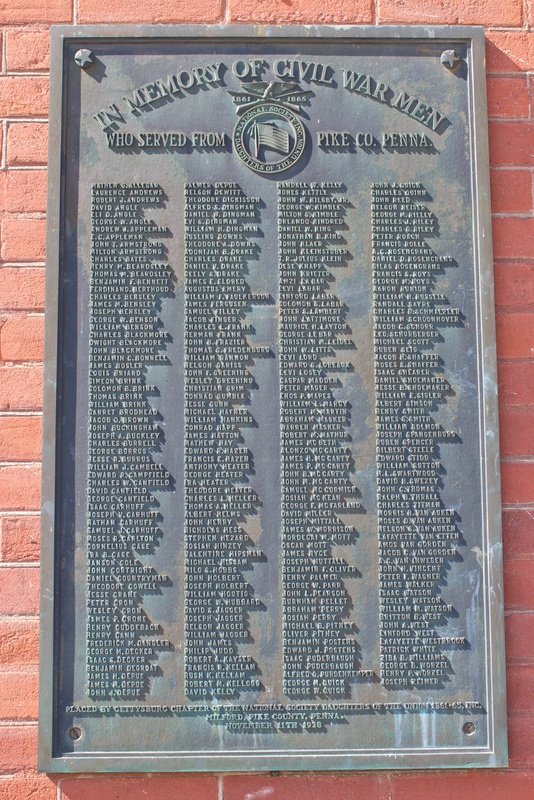 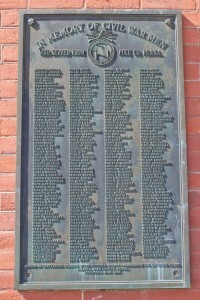 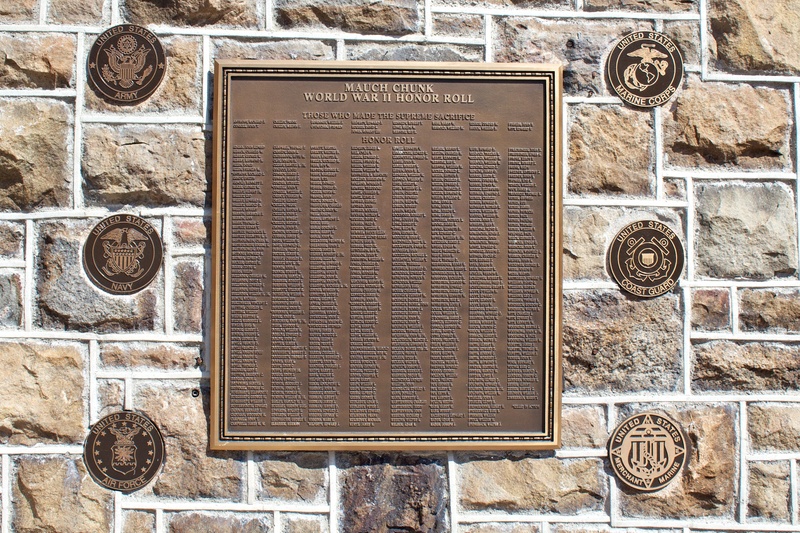 The plaque has eight columns of names, and honors 18 veterans who died during their World War II service. 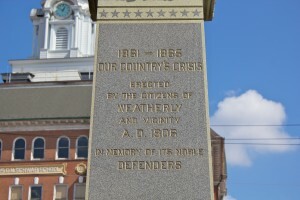 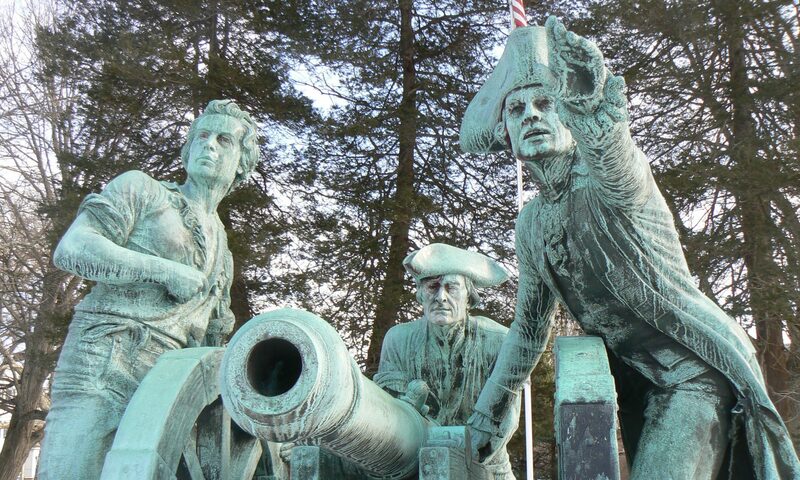 The monument was rededicated in 1993 after being damaged in a motor vehicle accident. 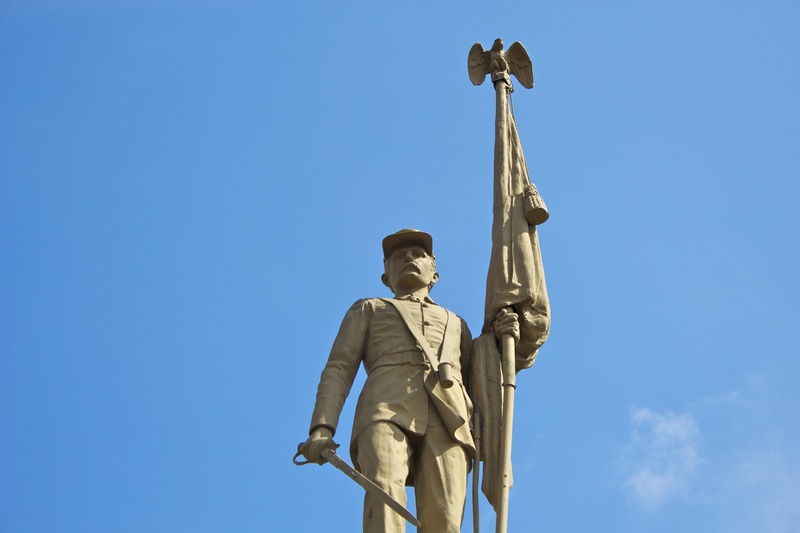 The Civil War monument was supplied by the Monumental Bronze Company of Bridgeport, CT, which also supplied the Soldiers’ and Sailors’ Monument in Stratford, CT. While there are some differences between the Jim Thorpe and Stratford monuments, such as the standard-bearer in Stratford and some ornamental details, the monuments are very similar. 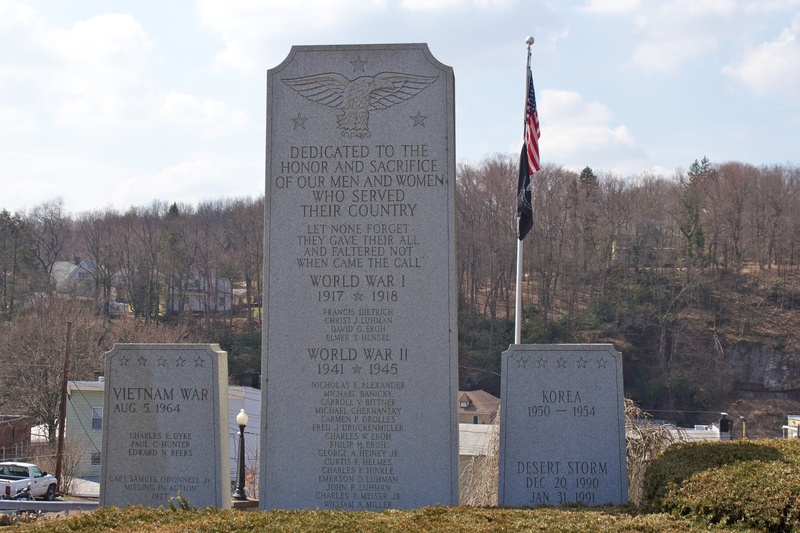 White bronze headstones can be seen in many older cemeteries, and can be recognized quickly by their distinctive pewter-like color. 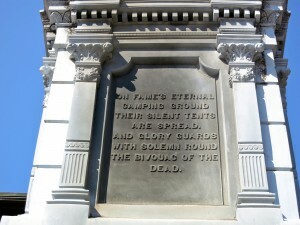 Zinc worked pretty well for smaller headstones, but the soft, brittle material created structural problems when it ws used for large Civil War monuments. 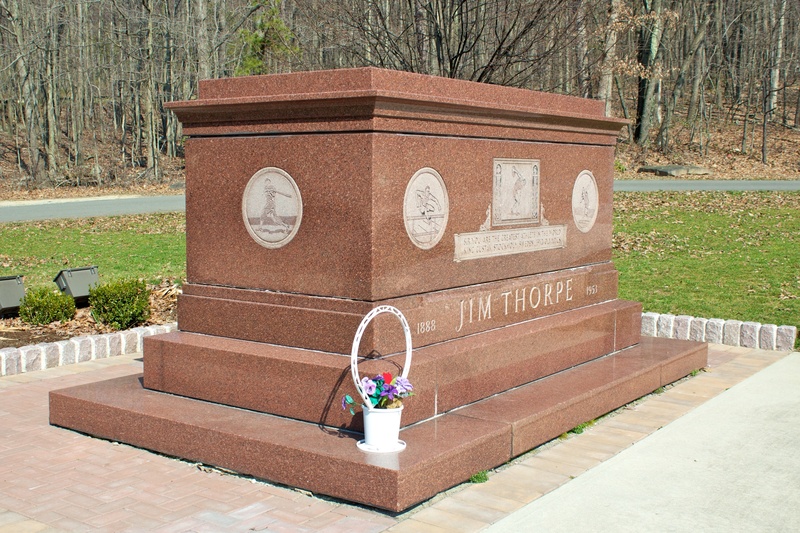 The Jim Thorpe monument received extensive work in 1984 to repair corrosion at its base. 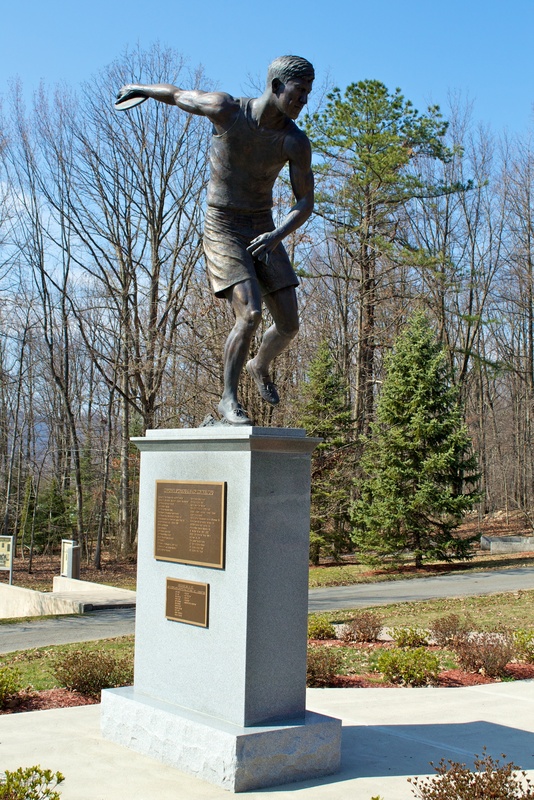 Jim Thorpe is buried in an eastern Pennsylvania town that changed its name and built a monument honoring the famous athlete to attract tourists. 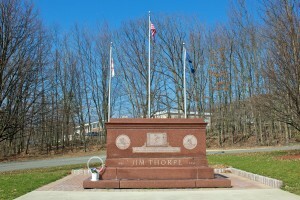 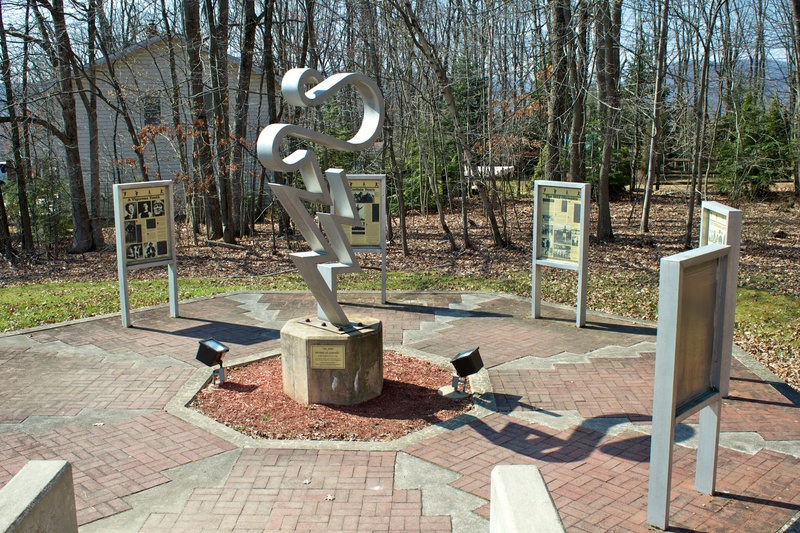 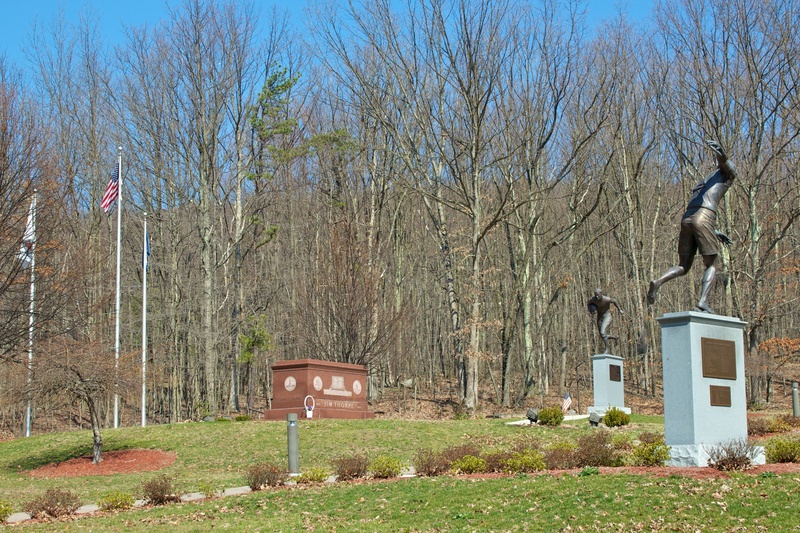 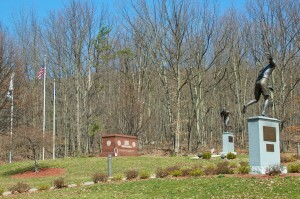 The Jim Thorpe Memorial site is on North Street (Route 93) in Jim Thorpe, PA. 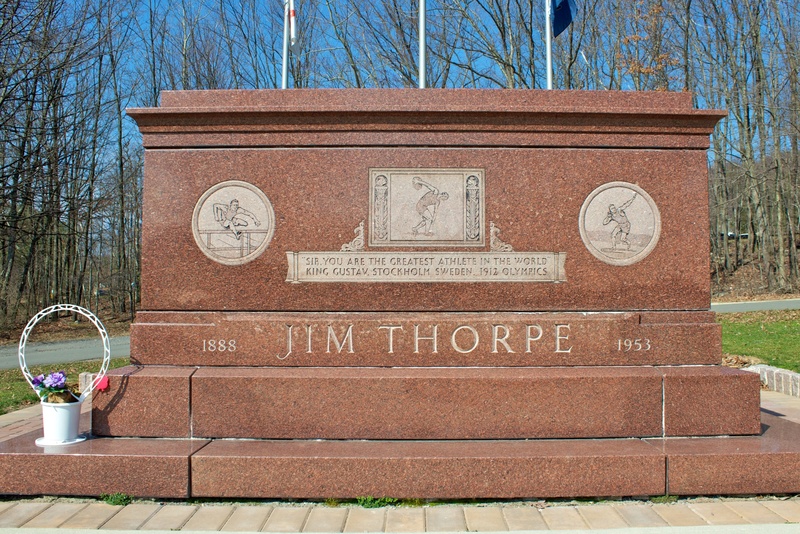 The site features a red marble memorial with his name and a quote from Sweden’s King Gustav V, who said after the 1912 Olympics that Thorpe was the world’s greatest athlete. 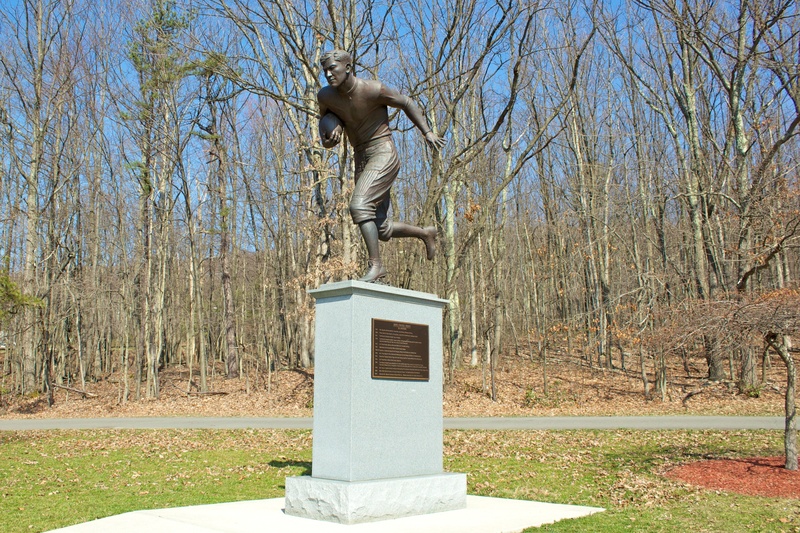 The monument also has several images depicting Thorpe competing in the numerous sports in which he excelled, including track and field, baseball and football. 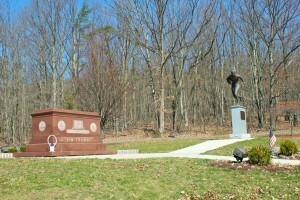 The mound on which the monument sits includes soil from Thorpe’s native Oklahoma, New York’s Polo Grounds and the Olympic stadium in Stockholm. 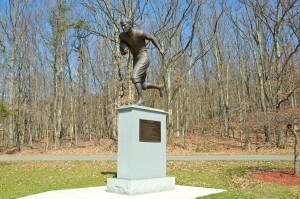 The site also pictures a 2007 statue depicting Thorpe as a football player, and another statue, dedicated in 2011, showing Thorpe with a discus. 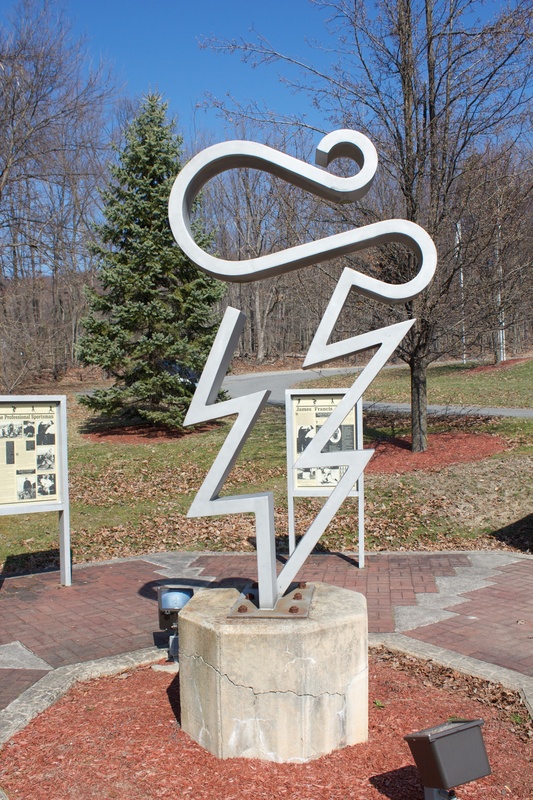 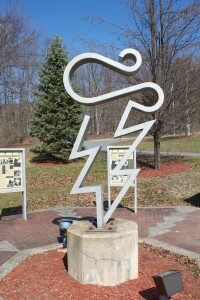 The Thorpe memorial also includes an abstract sculpture, The Spirit of Thunder and Lightning, that was dedicated in 1998. 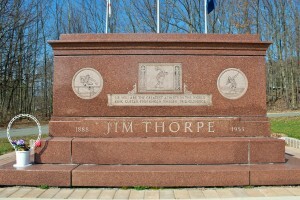 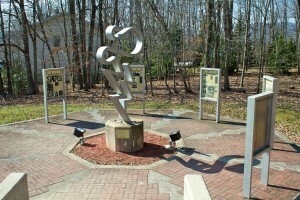 Surrounding the sculpture, several wayside markers provide highlights from Thorpe’s life and athletic achievements. 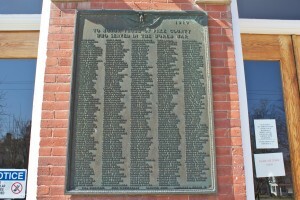 Thorpe, a member of the Sac and Fox tribe, was born in 1888 in Oklahoma. 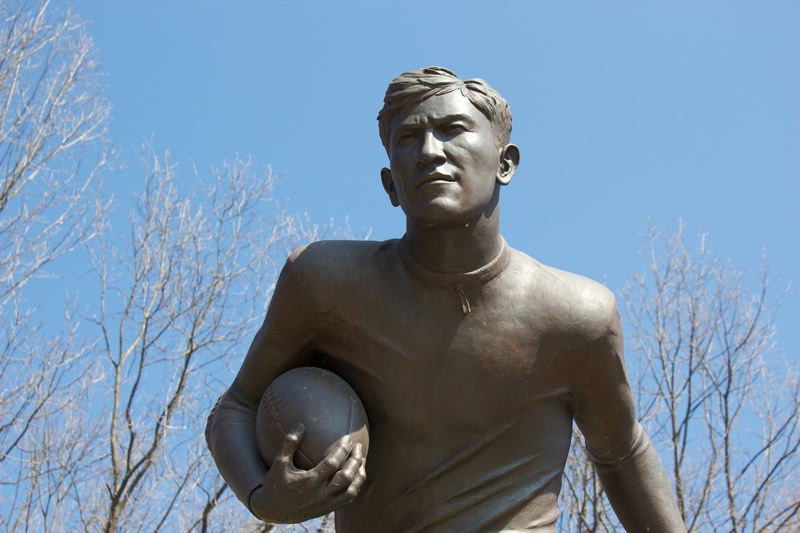 As a young man, he attended the Carlisle Indian Industrial School in Pennsylvania and led its football team to victories over nationally ranked teams. 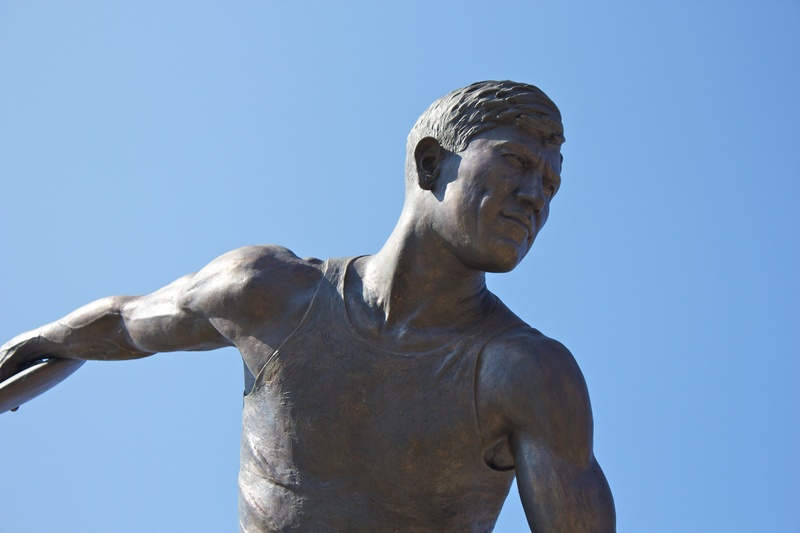 At the 1912 Olympics, Thorpe won gold medals in the decathlon and pentathlon. 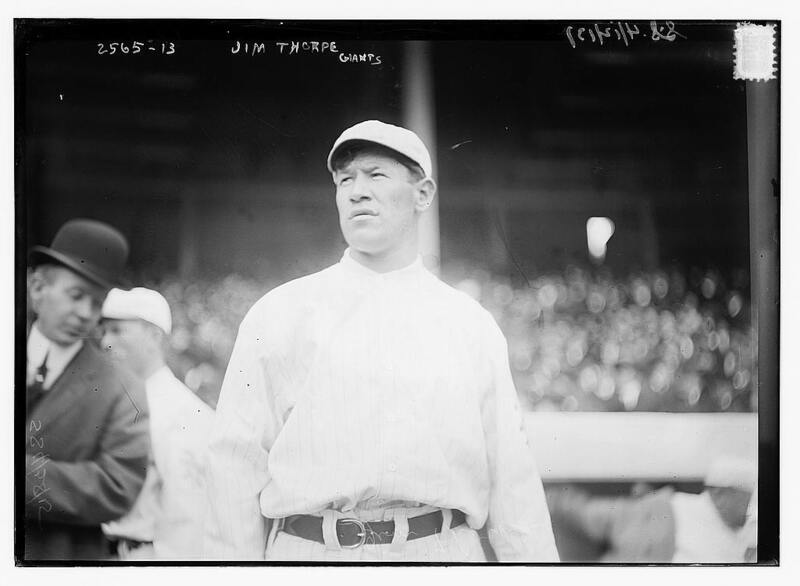 The medals were stripped a year later because Thorpe had previously played semi-pro baseball, but restored in 1982. After the Olympics, Thorpe played professional football for 14 years, and also played professional baseball for six of those years. He was voted the greatest athlete of the half-century in 1950, and in 1963 was part of the first group inducted in the NFL Hall of Fame. While it’s an impressive tribute to Thorpe’s athletic achievements, the memorial site is also the center of a controversy surrounding his burial in Pennsylvania nearly 60 years ago. 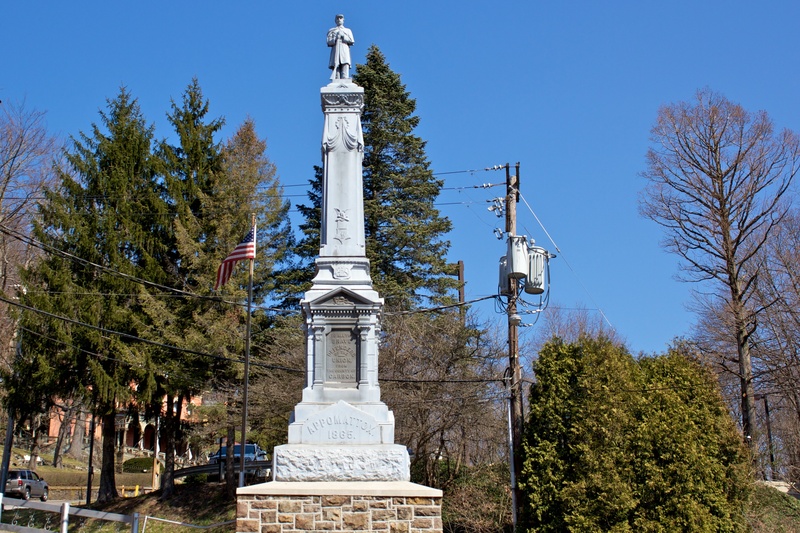 After Thorpe’s death in 1953, his third wife essentially auctioned the remains to two Pennsylvania communities, Mauch Chunk (Native American for “bear mountain”) and East Mauch Chunk. 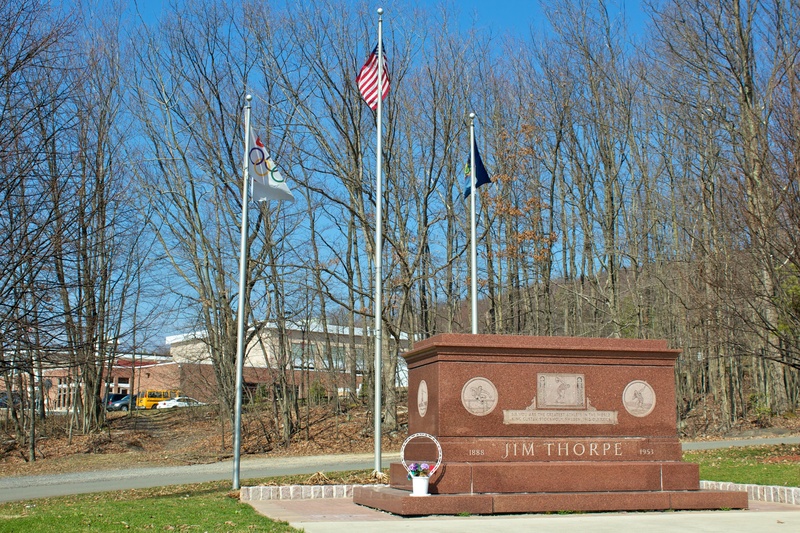 The Mauch Chunks, former mining and resort communities, were searching for an economic boost when they agreed to build a memorial to Thorpe, merge and change their combined name to Jim Thorpe. 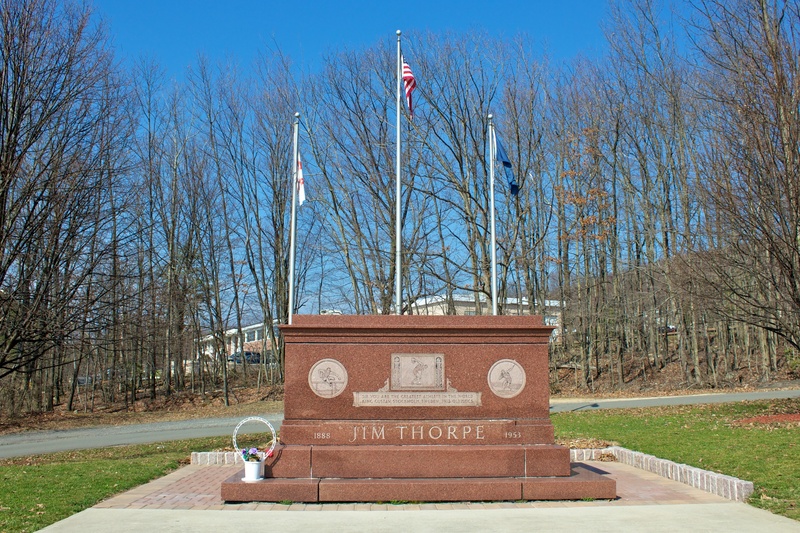 Local officials hoped a Thorpe memorial would attract the proposed pro football hall of fame and lead to the construction of other tourist destinations. 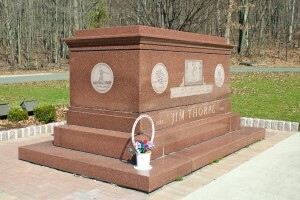 Other family members had planned to bury Thorpe on tribal land in Oklahoma, and were conducting a traditional feast the night before the scheduled funeral when Thorpe’s body was removed by his wife. 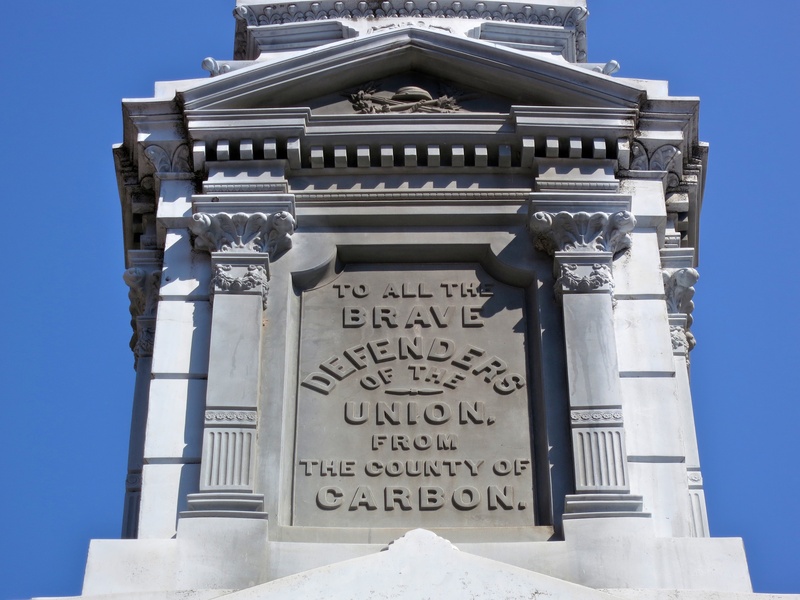 While Thorpe’s seven children remained divided over the years about his final resting place, the two surviving sons are continuing legal efforts to have his remains returned to Oklahoma.